Jim wants to know how he can prevent Word from capitalizing proper nouns (proper names) such as David, Shirley, Robert and so on. He has turned off the feature that capitalizes the first letter of sentences, but Word still capitalizes proper nouns for him. Jim doesn’t want Word to capitalize anything at all. 2. At the left side of the dialog box click Proofing. 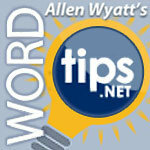 WordTips Microsoft Word, word tips. permalink.